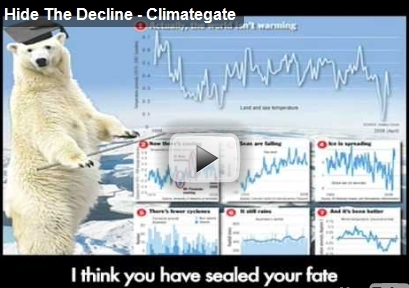 ClimateGate scientist Michael Mann has threatened Minnesotans For Global Warming with legal action if their hit video "Hide the Decline" is not removed from YouTube. As NewsBusters reported in November, M4GW, in response to highly incriminating e-mail messages hacked from the British Climatic Research Unit weeks earlier, created an absolutely delicious version of the Tommy James and the Shondells' classic "Draggin' the Line." On Tuesday, M4GW informed their many fans that for financial reasons they have complied with Mann's request. Penn State University's Michael Mann, one of the central figures in the Climategate scandal, has threatened legal action against Minnesotans for Global Warming (M4GW) over the group's popular satirical YouTube video "Hide the Decline." The No Cap-and-Trade Coalition, a group that includes M4GW, responded today at an event at the National Press Club, releasing Mann's threatening letter and an updated version of the "Hide the Decline" video. Minnesotans for Global Warming did comply with Mann's cease and desist demand, taking the "Hide the Decline" video down from their YouTube account and webpage. The No Cap and Trade Coalition unveiled a new video they're calling "Hide the Decline 2," however. It was screened at a press conference on April 20th and is available on YouTube and NoCapAndTrade.com. "I hope Dr. Mann does sue us," Said Davis, "The legal discovery process would give us an opportunity to expose Dr. Mann's research - or lack thereof to public and legal scrutiny." To further goad Mann, NCTC has posted the original version of "Hide the Decline" at its website. Will Mann take the bait?